Usb 3.0 And Usb 2.0 Compatibility. Sleek Compact Design With Plenty Of Storage. 2-Year Limited Warranty. With its sleek design and high storage capacity, My Passport from Western Digital provides a data storage solution for a variety of modern needs. This 2TB external hard disk drive (HDD) offers enough room to store all of your important documents as well as your favorite movies, games, and software. It’s easily portable and allows you to bring your files with you wherever you go, giving you access to the data you need even when you’re not at home. The Western Digital My Passport hard drive in black features USB 3.0 connectivity but can also connect via USB 2.0, ensuring compatibility across a wide range of devices. When plugged in to a USB 3.0 port, My Passport provides data transfer rates of up to 5 GB/s, making it easy for you to move files to and from your external hard drive at full speed. My Passport is capable of transferring a standard two-hour-long HD movie in as little as four minutes and 50 seconds or 500 photos in less than a minute, drastically cutting down on the time you spend waiting for your file transfer to complete. This external hard drive draws power directly through the USB connection and doesn’t require a separate power source, which helps keep its form slim and compact. Measuring in at 4.37 x 3.24 x 0.82 inches and weighing half a pound, My Passport is small enough to take with you when you’re on the move yet still provides the storage space you need to keep all of your files with you. It tucks away easily into a laptop bag or backpack for grab-and-go portability. My Passport from Western Digital works with most Windows operating systems, including Windows XP and Windows 8, and can be formatted to be compatible with the Mac OS. The external hard drive comes equipped with WD SmartWare, an automatic backup software that immediately backs up your files whenever you make changes. Whether you’re moving video files from your desktop to your external hard drive or simply editing a document, you can work confidently with the knowledge that you won’t lose any changes you’ve made. Accessories for My Passport include a USB cable. The HDD also features WD Security and WD Drive Utilities, which helps protect your files and maintains the drive’s integrity. Encrypt your files by setting a password using WD Security to prevent unauthorized access. For best results, use WD Drive Utilities as well to run diagnostics and check that your hard drive is healthy and useable for years to come. By keeping an eye on your HDD’s conditions, you’ll always know its status and can make sure you’re getting the best performance possible. 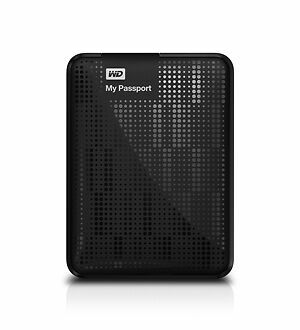 My Passport from Western Digital stands out from other external hard drives with its sleek, compact look; its large 2TB capacity; and its blazing data transfer rates. It’s equipped with several useful pieces of software for better data integrity and drive reliability, while its compatibility ensures that it can be used with a wide range of devices, giving you more versatility on the go. I have been using this for a couple of days now, no complications. Very easy to install and takes little effort, just plug and play. Very small size and easy to travel. Must bring USB cable with you everywhere because it is not a standard USB cable. Very small and lightweight for a hard drive. The tiny footprint fits perfectly on my small desk and the thing is almost totally silent. The display light lets you know when it's doing something, just sitting idle, or gone into standby mode. Two terabyte gives me all the backup space I need, and I'm backing up lots of movies, videos, photos, and music, as well as a plethora of documents. Fast and reliable with the best quality. Definitely a no-brainer! Always been a user of WD drives. Fast, reliable and the best quality. Before, I was using the WD My Passport Elite (640GB) and the WD My Book Home Edition (750GB). Eventually I found out that it's way more practical to buy a bigger drive and have it partitioned so I can use 1TB for files and leave the other 1TB for my Time Machine backup. I love the password protecting feature. Definitely a no-brainer. Quality product to my surprise. 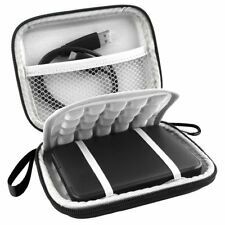 Wanted something to back up music files and provide portability when I travel to "stark" hotel rooms and generally access to "my" music while away from home. Doesn't heat up or feel warm at all. Very easy to use, light, rugged (to TSA people handling). Built in softwear even provides back up to my system. Overall, I will probably buy another when this one nears capacity.